Six months ago, I was in sorta-out-of-the-way Tachikawa, an area about an hour away from Tokyo Station. It's not a small station, but it's also not the first (or twentieth) place you'd think of when thinking about Tokyo neighborhoods. So I was surprised when I came across Iron Chef Chin (Chen, in America) Kenichi's giant backlit portrait looming over me on the seventh floor of the Granduo department store. 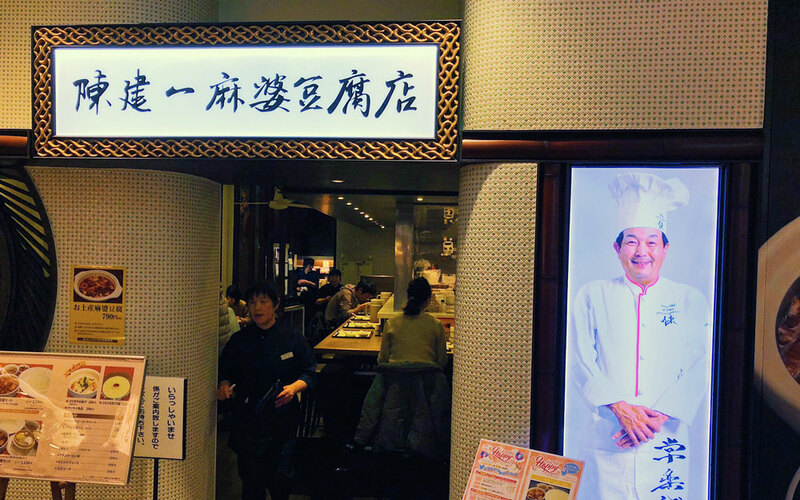 This was one of three mabodōfu chain restaurants made by the original Iron Chef Chinese. Fast forward to the present day. I've had Chin's mabodōfu seven times now. Despite being a mall chain restaurant, it holds up. Everybody needs to come here two to three times. The first time you'll think it's just okay. The second time it will be good. The third time you'll be addicted and I'll tell you why if you keep reading. In these grinders is the secret ingredient: Szechuan pepper. There's already some in your mabodōfu, but you should add more. 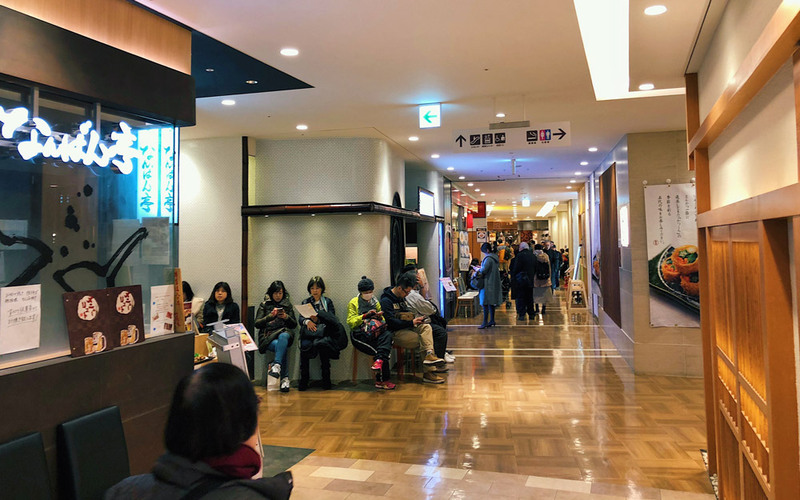 I'm not sure about the other two locations, but almost every time you come to Chin Kenichi Mabodōfu in Tachikawa, Tokyo, there will be a line. Mabodōfu, rice, onion soup, and pickles. Mabodōfu, rice, onion soup, pickles, and three dim sum. Please note that there are free refills on the soup and rice, so don't be afraid to ask for more if your rice:mabodōfu ratio gets out of whack. Ask for "hanbun" (half) on the rice so you don't end up wasting those precious white pearls. Of course, you can eat your mabodōfu however you want. It's a free country. But I would recommend taking a few scoops of mabodōfu with your spoon and putting half on top of and half next to your rice. This way your rice doesn't get too saturated with oils and sauces, but still gets a little bit. The next step… and this is the most important… is to take these pepper grinders and grind some pepper on top of your mabodōfu. In these grinders is the secret ingredient: Szechuan pepper. Although I think there's already some in your mabodōfu, you should add more. You have to. You may not like it at first, but if you keep doing it and maybe come back one more time, I promise you'll love it more than anything. 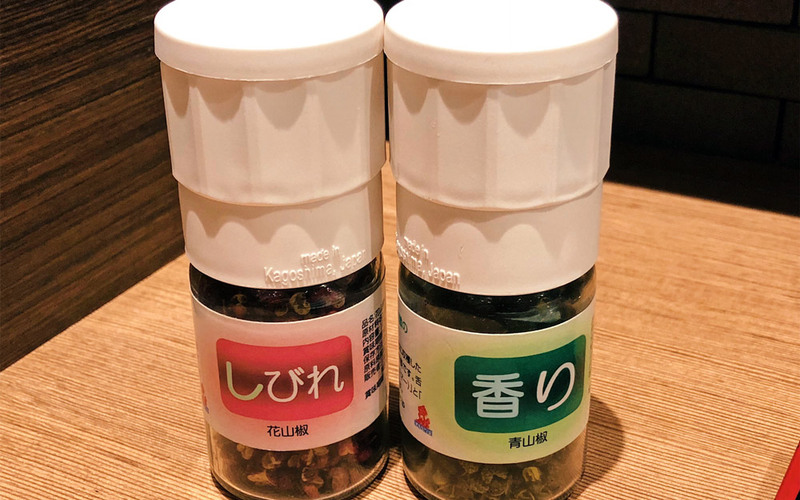 Buy some (they can be purchased at the register for about ￥1,000 each), take them home with you, and put Szechuan pepper on all your food. Honestly, it's an addiction, but I need more of you to get on board so I can form a support group. Oh, and it numbs your tongue and lips, thanks to the 3% hydroxy alpha sanshool, whatever that is. It manifests itself as a tiny, tingly feeling in your mouth which, for some reason, makes everything tastier. It alters your taste buds and brings out different tastes, especially in foods with stronger flavors. Coca-cola is fun, whereas water becomes an awful, bitter drink. "After eating Chin Kenichi's mabodōfu, I don't think I'll ever be able to eat another mabodōfu again." 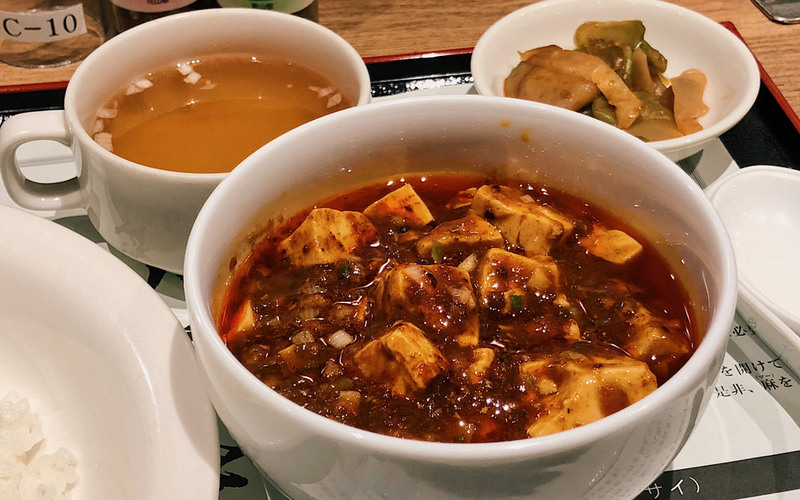 Traditionally, Szechuan pepper is put in spicy Szechuan foods to numb your mouth so that you can enjoy even spicier foods. The mabodōfu at Chin Kenichi's Mabodōfu isn't very spicy at all (though it's probably spicy for the "sensitive" Japanese palate). But it still adds a lot of wonderful flavor to the dish. The experience is weird, but totally worth it. 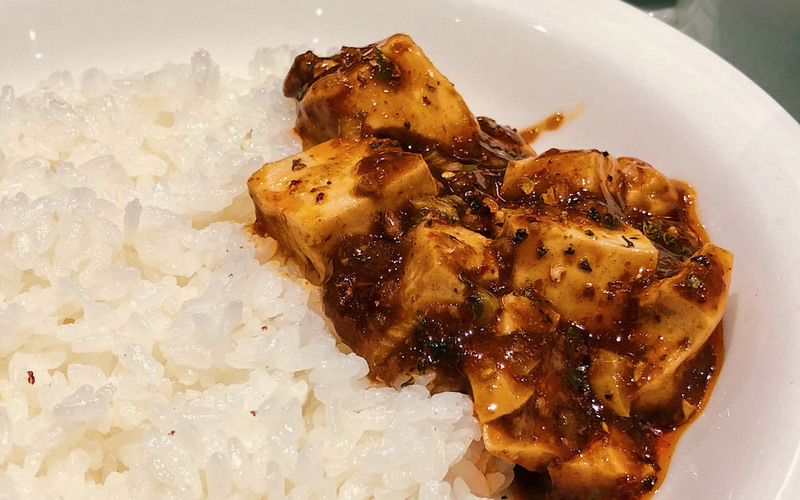 It expanded my idea of what taste is and I've been experimenting with it on other foods ever since (Japanese-style curry plus Szechuan pepper, it turns out, is awesome). Beyond the main set dishes, there are a couple sides you can choose from. 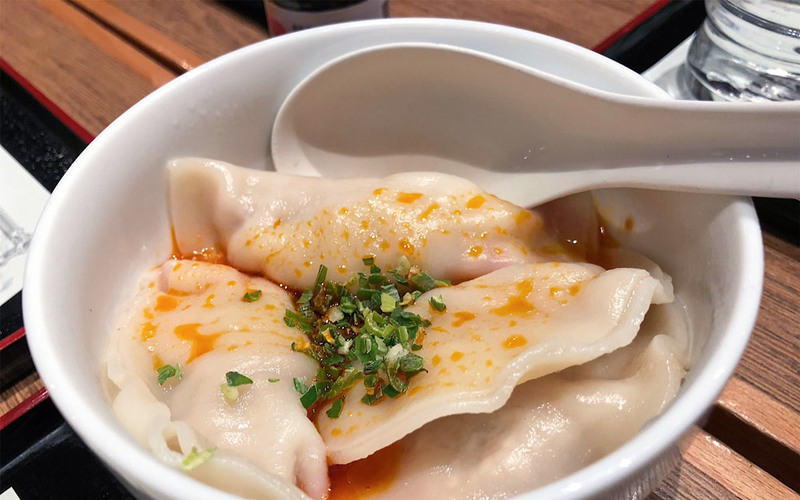 One is gyoza/dumplings seasoned with sesame, which is good, but I wouldn't order it unless you're sharing with a friend or two. The main set meal is plenty of food for most people, so don't overstuff yourself when you should be stuffing yourself on the dessert: annindōfu. 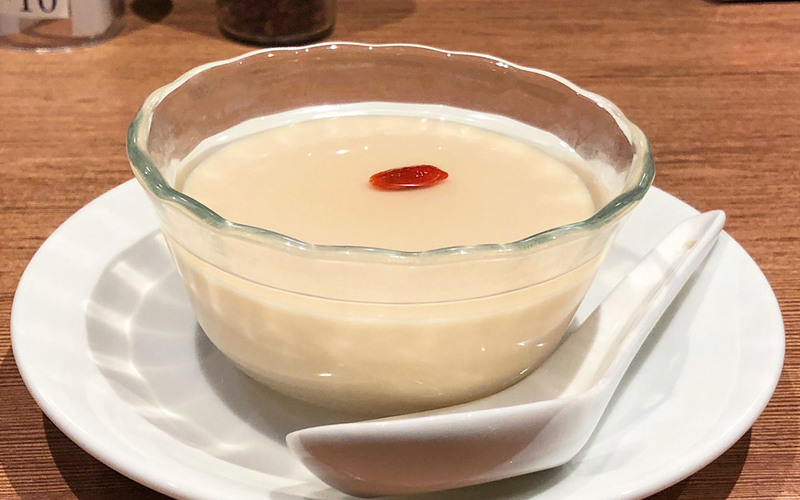 Annindōfu 杏仁豆腐（） is a sweet almond jelly traditional in Chinese cuisine. Order this with your meal and they'll bring it to you after you finish your mabodōfu. I've had some annindōfu in my day, but Chin really raises the bar. For me, a perfect meal here is the mabodōfu + dim sum set followed by annindōfu. Try it and I promise you won't be disappointed. 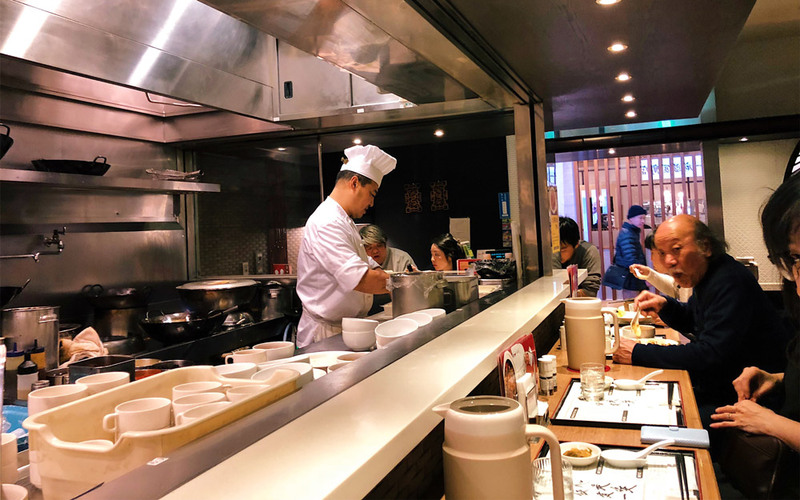 Chin Kenichi's Mabodōfu is not a complicated place. They make giant woks of mabodōfu. You eat mabodōfu. There are a couple sides available if you want a little something extra. And Szechuan pepper will change your tongue's life, if you let it. 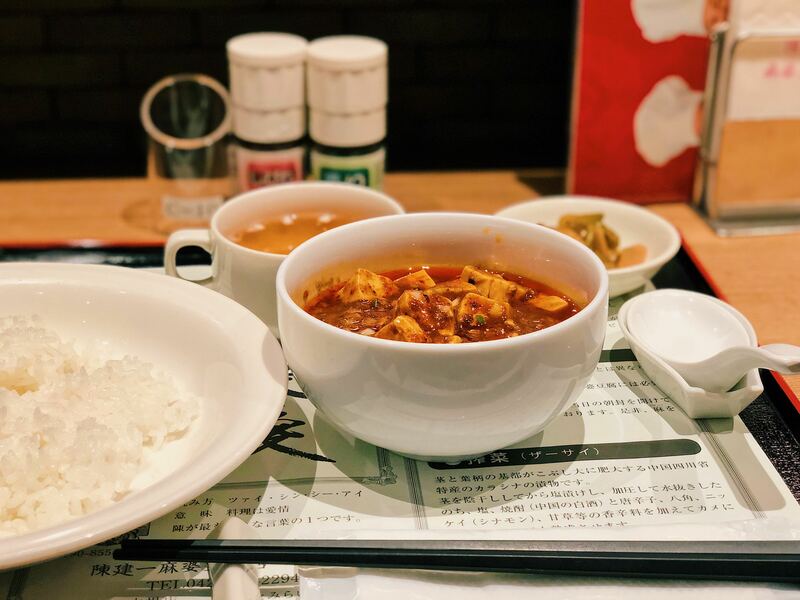 Although this isn't a fancy restaurant, don't pass it up if you're in the neighborhood (especially if you like mabodōfu even a little). There are three locations around Tokyo, though none of them are central. I've only been to the Tachikawa location, but there are locations in Yokohama and Kiba too. I would hope they all share the same recipe and Iron Chef level of quality. Chin’s mabodofu was one of the dishes on my bucket list. I was an avid viewer of the original Iron Chef back when they aired it on Food Network. I have to say, this restaurant doesn’t disappoint. Sure, this place is a chain, but the food is still delicious. I am a fan of their very limited menu as well. I recommend piling on the Szechuan peppers. They are a very, very weird experience at first, but you’ll get used to them—they add a nice flavor dimension to the dish. I’ve been here seven times. That number will almost definitely increase. I think that’s a better endorsement than any string of words is able provide. Hey Tofugu Faithful. My seven visits to this restaurant (so far) gave birth to an idea. There must be other original (because seriously, Bobby Flay is garbage) Iron Chef restaurants in Tokyo too! What if I visited each one and pitted them against each other in a kind of Iron Chef Battle Royale sequel? That's exactly what I did and we're currently working on that series now. Water tastes weird when you eat Szechuan pepper, but that's your own fault, isn't it?